Or How a Beginner Tackled the Task of Producing a Book Trailer. It was a sort of spur of the moment effort, which ended up taking a whole day. The opening scene still graces my desktop – elephants catching a patch of evening sunlight along a river in the Shaba Game Reserve (of Born Free fame). 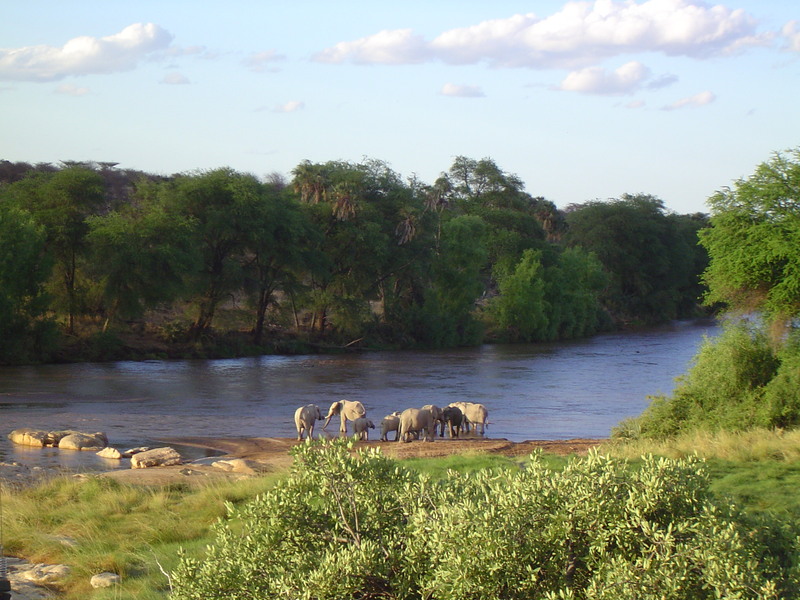 We jetted there on an amazing luxury safari with family in 2007, and enjoyed an exclusive silver-service camp communing with nature. I know elephants don’t feature in BREATH OF AFRICA, but this is my favourite picture. 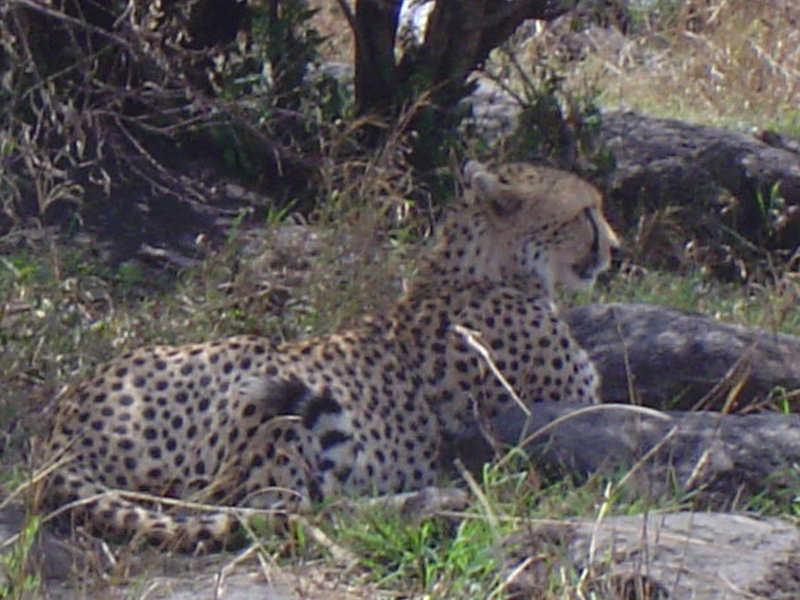 Charles, dreaming of Oxford – I thought this close-up of a cheetah in the Mara with a far-off look in its eye, captured what the young man might have been feeling as he fledged his wings. 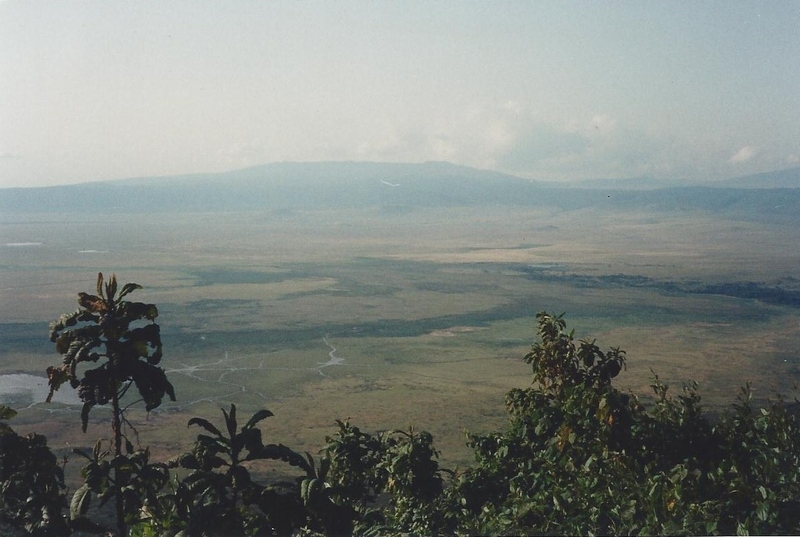 Dreamy Ngorongoro crater in Tanzania was photographed in 1965 or thereabouts with my first camera, a Brownie (I think). It’s not a very good picture, but to me it exudes romance, and the title of my book comes from Caroline’s reaction when she first sees this vista. 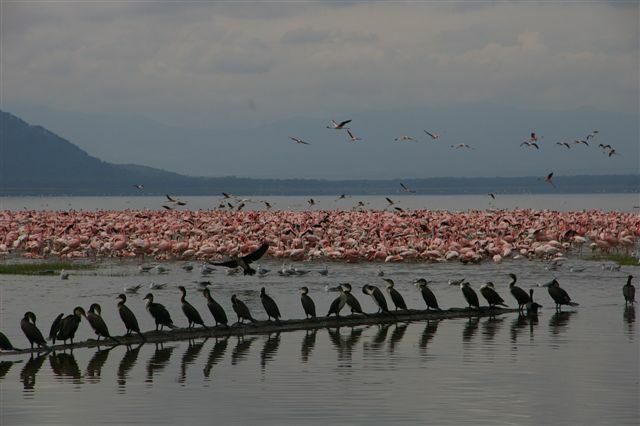 Then a fanfare of beauty – flamingos and cormorants on Lake Nakuru, with Lion Hill in the background. Thankyou Colin (my son) for this dramatic photo. I have experienced this amazing lake in all its forms over the years: sheets of still water slowly diminishing, clouds of billowing, spiralling soda dust, a blazing mass of pink flamingos. As you get nearer, there is a distinct stench of burnt feathers and bird excreta in the gluey mud. And even a smooth hard surface for termagent teenagers to tear along in their parents’ 4WD’s before they are old enough to get a driving licence. And all the while, the skies above are ever changing, ever dramatic. So – it’s Lake Magadi in the book, but you can get my drift. Back to earth, and the busyness of humdrum life. 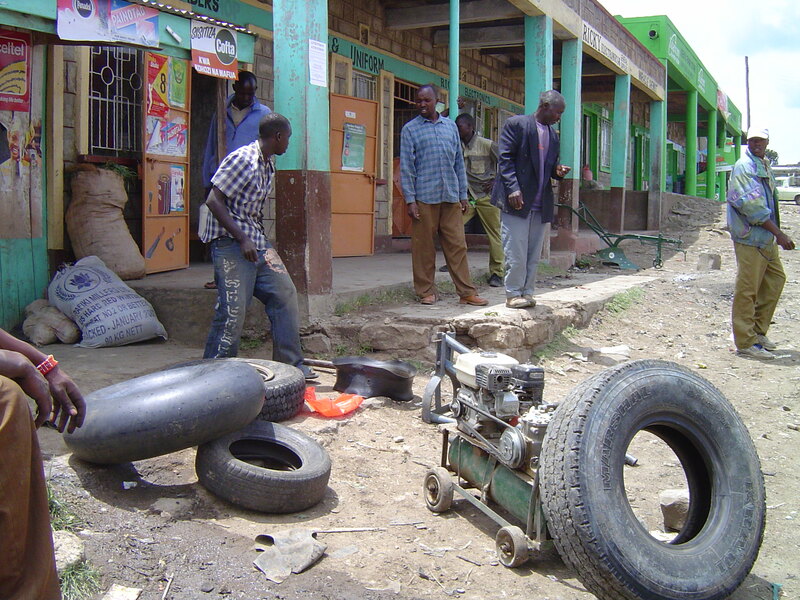 A “jua kali” tyre-mending business captured by my camera in a dusty wayside village somewhere in the highlands. It might just as easily have been on the notorious River Road, Nairobi, where Charles’s cousin started his garage. The words mean “hot sun” by the way: referring to entrepreneurs who don’t have a roof over their heads. There’s plenty of hot sun in Africa. I won’t apologise for the plethora of photographs you have to wade through at this stage. It was necessary to fit in with the music, and you’ll never see anything like these scenes, unless you go to Africa. 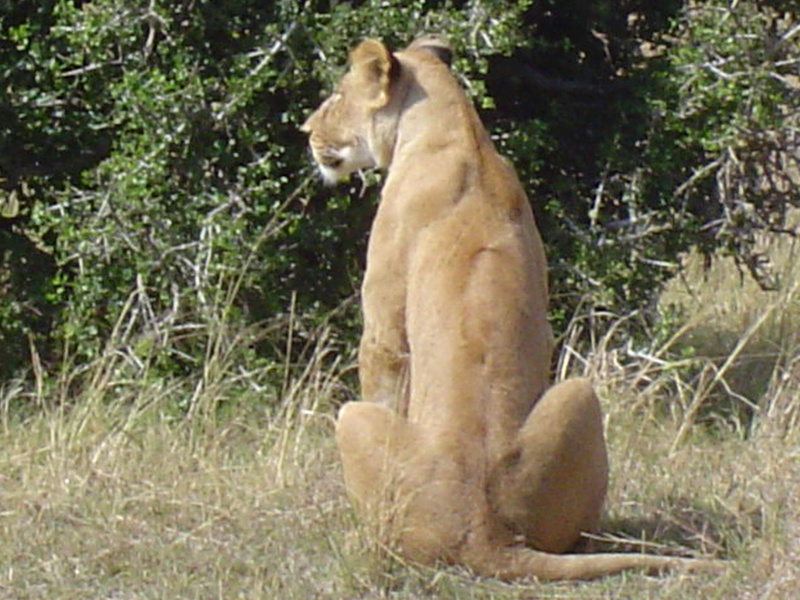 And the lion, sitting… waiting… watching… may not at first glance be considered a suitable illustration, with the word “terror” inscribed over its bum. But if you think of the poor gazelle, frozen with fright, which might be cowering in that bush, you may get a feel for the psychological hold of witchcraft running as a thread through the book. Mwangi, the villain of the story, is introduced in the trailer via a derelict building site looking over what used to be Nairobi Dam, where colourful boats used to sail on a Sunday. Now, the water is covered with weed (that’s the green bit in the middle ground) and nobody would want to sail in it anyway, as the effluent from the Kibera slums beyond drains into it. The tinny clash of cymbals goes well with those corrugated iron roofs, I thought. 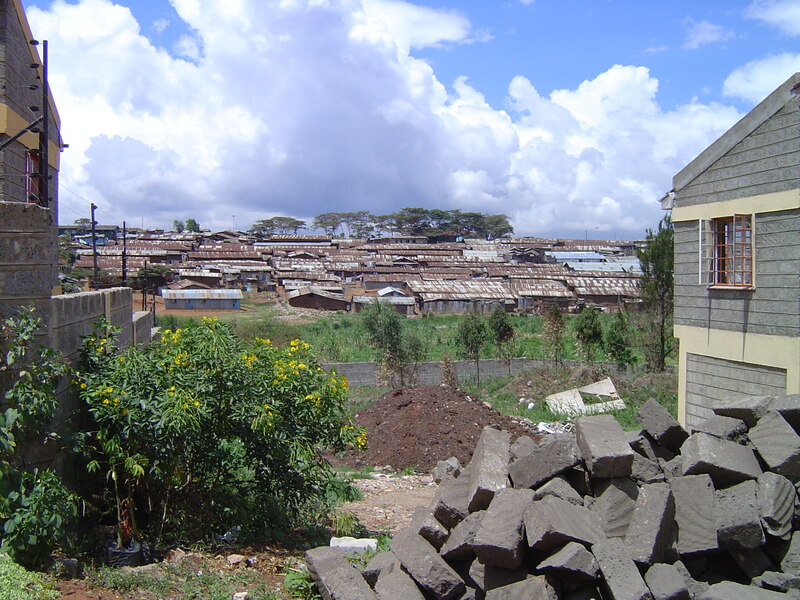 You can imagine the contrast of this eyesore against the modern skyline of Nairobi city on its doorstep. One thing which never failed to astonish me was the stream of pedestrians which flowed from these slums on workday mornings, immaculately dressed in spotless bright clothes, to disperse into gleaming offices. 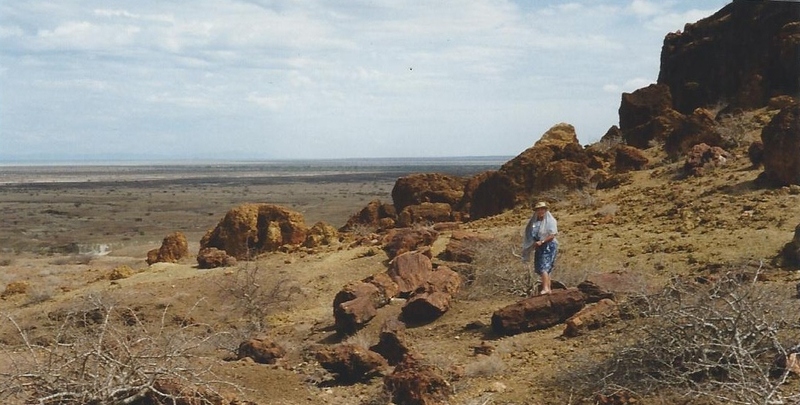 This entry was posted in Breath of Africa and tagged Africa, Kenya, Lake Magadi, Lake Nakuru, Lake Turkana, Maasai, Nairobi, Nairobi Dam, Richard Leakey. Bookmark the permalink. I went to Kenya and Tanzenia in ’88. there were 18 of us in the family that went and had a wonderful time! your pictures make me miss it. Thankyou for the comment, magmap – I’m so glad you enjoyed the pictures.